Production: Warner Bros. Pictures, Inc.; black and white, 35mm; running time: 77 minutes. Released January 1931. Filmed summer-fall 1930 in Warner Bros. studios. Cost budgeted at £700,000. Screenplay: Frances Faragogh and Robert E. Lee, from a novel by William B. Burnett; photography: Tony Gaudio; editor: Ray Curtiss; art director: Anton Grot; music director: Erno Rapee. Cast: Edward G. Robinson ( Cesare Bandello, alias Rico ); Douglas Fairbanks, Jr. ( Joe Massara ); Glenda Farrell ( Olga Stassoff ); Sidney Blackmer ( Big Boy ); Thomas Jackson ( Sergeant Flaherty ); Ralph Ince ( Pete Montana ); William Collier, Jr. ( Tony Passa ); Maurice Black ( Little Arnie Lorch ); Stanley Fields ( Sam Vettori ); George E. Stone ( Otero ); Armand Kaliz ( DeVoss ); Nick Bela ( Ritz Colonna ); Noel Madison ( Pepi ); Ben Hendricks, Jr. ( Kid Bean ); Lucille La Verne ( Ma Magdalena ); Landers Stevens ( Commissioner McClure ); George Daly ( Machine gunner ); Ernie Adams ( Cashier ); Larry Steers ( Cafe guest ); Louis Natheaux ( Hood ); Kerman Cripps ( Detective ). Faragogh, Frances, and Robert E. Lee, Little Caesar , edited by Gerald Peary, Madison, Wisconsin, 1981. Tyler, Parker, The Hollywood Hallucination , New York, 1944. LeRoy, Mervyn, as told to Alyce Canfield, It Takes More Than Talent , New York, 1953. Connell, Brian, Knight Errant: A Biography of Douglas Fairbanks, Jr. , New York, 1955. Everson, William K., The Bad Guys , New York, 1964. Baxter, John, The Gangster Film , New York, 1970. McArthur, Colin, Underworld U.S.A. , London, 1971. Lee, Raymond, and B. C. Van Hecke, Gangsters and Hoodlums: The Underworld in Cinema , New York, 1971. Bergman, Andrew, We're in the Money: Depression America and Its Films , New York, 1971. Parish, James Robert, and Alvin H. Marill, The Cinema of Edward G. Robinson , South Brunswick, New Jersey, 1972. Canham, Kingsley, The Hollywood Professionals , vol. 5, 1973, London. Robinson, Edward G., and Leonard Spigelgass, All My Yesterdays , New York, 1973. Kaminsky, Stuart M., American Film Genres , Dayton, Ohio, 1974; revised edition, Chicago, 1985. LeRoy, Mervyn, Take One , New York, 1974. Parish, James Robert, and Michael Pitts, The Great Gangster Pictures , Metuchen, New Jersey, 1976. Shadoian, Jack, Dreams and Dead Ends: The American Gangster/ Crime Film , Cambridge, Massachusetts, 1977. Clarens, Carlos, Crime Movies , New York, 1980. Schatz, Thomas, Hollywood Genres , New York, 1981. Marill, Alvin H., The Complete Films of Edward G. Robinson , Secaucus, 1990. Munby, Jonathan, Public Enemies, Public Heroes: Screening the Gangster from Little Caesar to Touch of Evil , Chicago, 1999. Hall, Mordaunt, in New York Times , 10 January 1931. Variety (New York), 14 January 1931. New Yorker , 17 January 1931. LeRoy, Mervyn, "The Making of Mervyn LeRoy," in Films in Review (New York), May 1953. 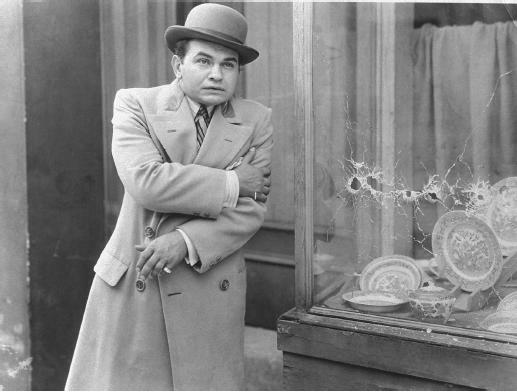 Eyles, Allen, "Edward G. Robinson," in Films and Filming (London), January 1964. Roman, Robert, "Edward G. Robinson," in Films in Review (New York), August-September 1966. Warshow, Robert, "The Gangster as Tragic Hero," in The Immediate Experience , New York, 1970. Velvet Light Trap (Madison, Wisconsin), June 1971. Kaminsky, Stuart M., " Little Caesar and Its Role in the Gangster Film Genre," in Journal of Popular Culture (Bowling Green, Ohio), Summer 1972. Kjørup, S., "Klassiske gangsterfilm og deres baggrund," in Kosmorama (Copenhagen), August 1973. Peary, Gerald, "Vers une definition du film de gangster," in Positif (Paris), July-August 1975. Monthly Film Bulletin (London), November 1975. Canham, Kingsley, "Mervyn LeRoy: Star-Making, Studio Systems, and Style," in The Hollywood Professionals 5 , London, 1976. Perez, M., in Avant-Scène du Cinéma (Paris), 1 October 1979. Little Caesar , like any of the early 1930s gangster films, provides a convenient starting point for discussing four historical (and traditional) topics: the relationship between film and society, generic evolution, censorship and self-regulation, and sound technology. I wish to stress the interdependence of these four aspects. Many historians cite the gangster film as one of the Hollywood genres which emerged with the dissemination of sound technology. The colloquial dialogue, jazz music, and sound effects clearly help delineate the genre, but nonetheless, the gangster film began during the silent era. Sound technology merely provided the means for a secondary step in the genre's evolution. The power of this "second phase" gangster film stems from its contemporaneous setting and social commentary on violence, organized crime, Prohibition, the Depression, and the urban environment. Addressing such topical subjects invoked the threat of censorship and led to the industry's response of self-regulation. This in turn forced the genre to change once again. Since Little Caesar seems most readily and specifically classified as a gangster film (as opposed to a sound film or a self-regulation film) I will focus my discussion around the film as an example of the gangster genre. Thomas Schatz, in Hollywood Genres , borrows from Christian Metz and Henri Focillon to analyze the evolution of genres. He proposes four stages (from Focillon): "experimental" which establishes visual, structural, and thematic conventions; "classical" which reifies the conventions and uses them to directly address cultural values; "refined" which adds visual and structural flourishes but maintains cultural values through reified thematic concerns; and "baroque" which employs self-reflexivity, intertextuality, and most importantly, deconstructs themes and cultural values. I need only address the first three stages for Little Caesar . The silent gangster films like D. W. Griffith's Musketeers of Pig Alley (1912), Howard Hughes's The Racket (1927), and Josef von Sternberg's "trilogy" of Underworld (1927), The Dragnet (1928), and Thunderbolt (1929), and the early sound films like Thunderbolt (which began production as a silent but also released in a sound version) and Bryan Foy's The Lights of New York (1928) easily fit the "experimental" label. They developed the basic conventions of the genre, but failed to establish a strong and direct connection to the culture. By the early 1930s, sound technology posed few problems; the "blimped" camera allowed exterior shooting and mobility and sound-on-film guaranteed synchronous projection. The Depression entered its worst period. Prohibition drew to a close and, as it did, gang wars escalated; the St. Valentine's Day Massacre of 1929 focussing public attention on the organized power and violence of the gangster. This combination of events provided the necessary background for the "classical" phase. Films of this stage, which Little Caesar initiated, include two other "standards": Public Enemy (1931) and Scarface (1932). Together these three films express the visual, structural, and thematic values most closely associated with the genre and clearly comment on the culture of the early 1930s. Little Caesar tells the story of the rise and fall of a petty thief, Rico Bandello, with ambition to become a crime lord. He achieves his goal, but dies under the hail of machine gun fire. Little Caesar celebrates the gangster, establishing Rico romantically; as a "tragic hero" according to Robert Warshow. As a "tragic hero" he must die, and he dies because of a tragic flaw. Warshow sees Rico's tragic flaw, like all gangsters, as a too strong drive for success and self-assertion. Organized crime differs from organized business only in its means and cultural stigma. Both function as rational enterprises and permit a man to become "self-made," well-known, admired by his peers, and share in the wealth of America. Rico desires the same American dream Western culture assumes we all share: upward social and economic mobility and individual recognition. Denied a legitimate route to power and success, but cursed with his "tragic flaw," Rico must employ means deemed "illegal." His violent deeds turn the American dream of success into an American nightmare of success. Little Caesar also depicts society's efforts to maintain social order and similarity against Rico's criminal drive for success and individuality. Rico must fall from the top of the criminal ladder and then die to emphasize what happens to those who challenge society. Exactly what constitutes the "crime" for which he must fall and die? His breaking of the law or his too strong drive for personal success? Both: Rico must die legally and ideologically. Rico doesn't die simply because he transgressed the law of society, he dies because he aggressively asserted himself as an individual and as a success. Gangster films, like all genres, maintain the status quo and make it ideal. Little Caesar shows that crime doesn't pay and that an over-riding desire for wealth, power, and individuality is culturally unhealthy. This social commentary remained part of the gangster genre since its "classical" stage, but never in deeper relief than during the early 1930s. The economic plight of millions of American citizens seemed to find an answer in the gangster's method. An audience, enduring the Depression and the backlash of Prohibition (organized crime greatly expanded in urban centers), could vicariously participate in a gangster's rise to wealth and power. Yet the generic demands for the gangster's legal and ideological death would re-assure an audience that those means would ultimately prove untenable. The status quo must prevail even during the double crisis of the Depression and Prohibition. The enormous popularity of the gangster films coupled with their romantic depiction of achieving success and fame during the Depression, led to the "classical" stage's quick demise. By refracting so strongly the cultural climate of the day, they posed a threat to the status quo. In 1934, the Catholic Legion of Decency formed, in part to combat the popular depiction of the gangster as a folk hero, and the Hays Office created the Production Code of America essentially for the same reason. Consequently, the "classical" stage lasted only four years (1930–34). With the threat of censorship, boycotts, and self-regulation, the gangster film evolved into two "diluted" species: what Schatz labels the "gangster-as-cop" variation (e.g. G-Men  and Racket Busters ) and the "Cain-and-Abel" variation (e.g. Manhattan Melodrama  and Angels With Dirty Faces ). Both forms constitute the "refined" stage. They permit stylistic flourishes yet maintain, however watered-down and disguised by style, the same themes and cultural values of the "classical" stage. Little Caesar stands as a perfect example of the short-lived "classical" period. Rico functions as the prototype of all subsequent gangsters. His career trajectory allowed audience identification and provided a warning to embrace the status quo. That the type of film Little Caesar initiated flourished only briefly, attests to the strength of that identification and the calling into question of American cultural values during times of crisis.